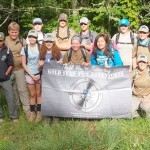 Gold Star Teen Adventures returned to Western North Carolina on June 18 for the Alumni Outdoor Leadership Adventure. 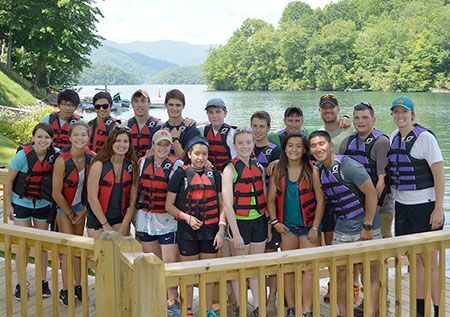 Comprised of teens and mentors who attended last year’s Adventure Leadership Outdoor Camp, the group arrived Thursday night to Franklin, NC and began the preparation for this week long adventure. See photo gallery at bottom of page. Following a mission briefing Thursday evening by the organization’s founder, Kent Solheim, the team began organizing their packs and accounting for the gear they would need to begin their adventure early Friday morning. This year’s team consisted of 18 members. Along with Solheim leading, the team was comprised of a trail guide and a medical technician from the local area, five mentors from the military academies, and ten Gold Star Teens. Their adventure called for a long hike across rigorous ground covering sections of the Appalachian and Bartram Trails. These sections of trail would be approximately 22 miles covered over three days. For safety along the isolated trails, their map identified eight extraction points in case they needed to get a teen, or the team, off the trail sooner than expected. Early Friday morning they awoke, ate a hot breakfast prepared by volunteers, loaded into a church bus, and departed the event’s headquarters located in a mountain cove just outside the Franklin city limits. Their trip would begin at a trail head just below a popular hiking/sightseeing spot called Picken’s Nose in southern Macon County, NC. The challenges started right away with an initial hike that climbed over 2,600 feet to the base of Picken’s Nose over only 2.5 miles of trail. 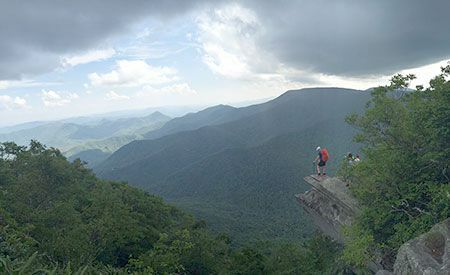 Once there, the group completed a short rock climbing exercise on the face of Picken’s Nose before continuing their trek that led across further strenuous sections, upward to the Albert Mountain Fire Tower, over Wayah and Wesser Balds, and on to the marina on Nantahala Lake. 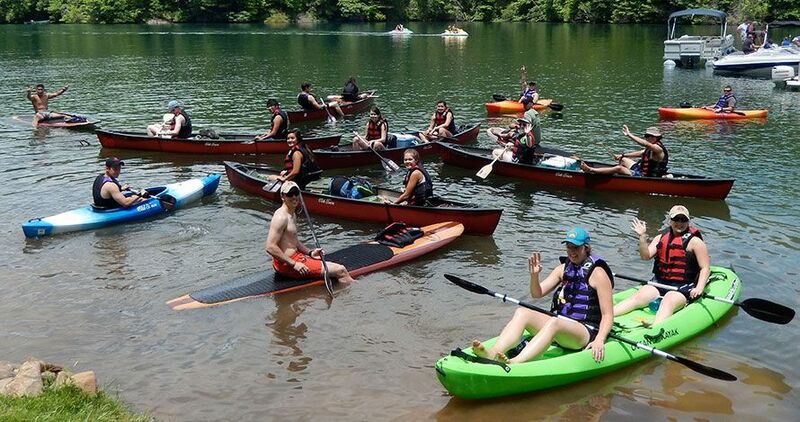 At Nantahala Lake, they paddled boats across the lake to stay overnight on an island. Monday morning, the team participated in kayak and leadership exercises. Returning to the marina on Monday afternoon, they were again transported by bus back to their Franklin headquarters for their final night. That evening, following a grand meal sponsored by the Franklin NC Daybreak Rotary, the event’s awards ceremony was held and a final night of fellowship among the teens was spent in games and competition. 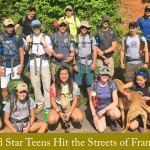 With another successful week for the Gold Star Teen Adventures completed, the team members returned home on Tuesday, June 23. The next event will be the Adventure Leadership Outdoors Camp to be held in July. Like last year, the Basic Camp will span a week, starting at Ft. Bragg, NC and concluding in Franklin, NC. To learn more about last year’s camp, go to Gold Star Teen Adventures Gearing Up for 2015! Duotech is a proud supporter of Gold Star Teen Adventures. Gold Star Teen Adventures provides unique summer adventure opportunities for Gold Star Youth. The purpose of the program is to provide healing, mentorship, development, and opportunity to the children of special operations Service Members who lost their lives in the line of duty. The program serves youth of fallen United States military special operations service members, consisting of Army Special Forces (Green Berets), Army Rangers (75th Ranger Regiment), the 160th Special Operations Aviation Regiment, 95th Civil Affairs Brigade, 4th MISOC, Navy Small Boat Teams, Navy SEALs, Air Force Combat Controllers, Air Force rotary and fixed wing squadrons, and Marine Corps special operations personnel. 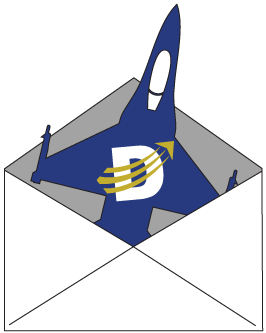 Learn more on their website.